My domesticated life, without a job, has been spent at home testing out several different recipes. Ever since I made a visit to Europe, tasted fresh-made lasagna, I have been on the hunt for a recipe to duplicate that taste. The other day, I was bold enough to attempt fresh pasta and was quite pleased with the results. Pasta recipes are all the same. There are variations but stick to a recipe that calls for flour and eggs. Of course I used organic, unbleached flour and free-range chicken eggs. I also added some salt and a splash of olive oil. 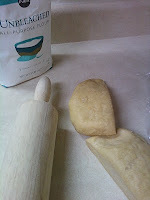 I will experiment with different types of flour in the future after I've mastered the basics. The dough took a little while to come together since I kneaded it by hand (I don't have a mixer). What took most of my time though was rolling out the dough. 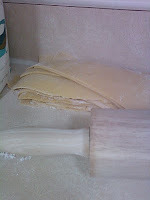 I suggest getting a pasta machine to roll out the dough or you'll be slaving over it for a few hours. After an hour of rolling, I gave up and went with the thick noodles. It worked out fine. 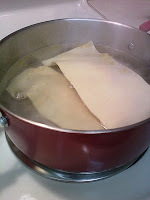 Before I rolled out the dough, I set it to rest and put together the meat sauce. On special occasions I make "real" sauce, from scratch but this was not that special of an occasion so I went with Paul Newman's brand of marinara and coupled that with Italian turkey sausage. 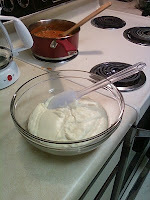 After the meat sauce, I whipped together a bechamel. Bechamel is a white sauce made of butter, flour, and milk or cream. The variation on this bechamel is that I added nutmeg. I have never heard of using a bechamel in lasagna but it proved to be the trick that put me one step closer to the lasagna I tasted in Europe. So when layering your lasagna, go with meat sauce on the bottom. Lasagna then bechamel and meat sauce, and repeat. I did not use ANY shredded cheese with this. I think the shredded cheese is only used in America. There were medallions of either goat or feta cheese in Europe. Either way, I left out the shredded cheese and it came out wonderful! The taste was fantastic! Ok, so google away for the pasta recipe and the bechamel. Yum, yum, and more yum! You are quite the cook! I've never heard of bechamel before. Learned something new! I sure bet it was good. Do you think you're going to invest in a pasta machine? Out With the Junk... LITERALLY!